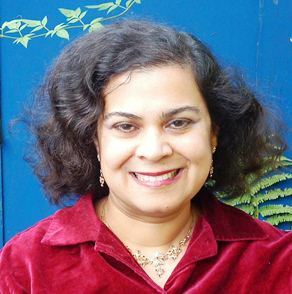 Click, or right click, on an image to see a larger version. We have had wanted to visit the Alhambra for many years, and this dream came true in December 2010, while Granada, and the rest of Europe was enduring its coldest winter for years. Granada is a rugged mountain city with steep winding roads. The Alhambra is at the top of one of these, and is a large complex including a place, mosque, fort and extensive gardens. The Nasrid Palace is the star attraction. One enters through a rather disappointing entrance and into a dark hall with a carved wooden ceiling and plaster work. 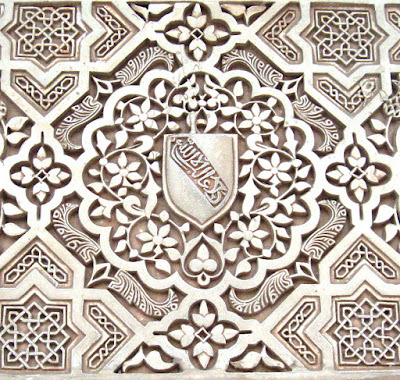 Water played an important role in Moorish architecture. Same view of the Harem courtyard at the Alhambra from furtherback. Apparently the Alhambra was designed to be renewed and redecorated by successive rulers. Much of the decoration is plaster, and in parts, which naturally I didn’t bother photographing, on can see it in a state of decay. 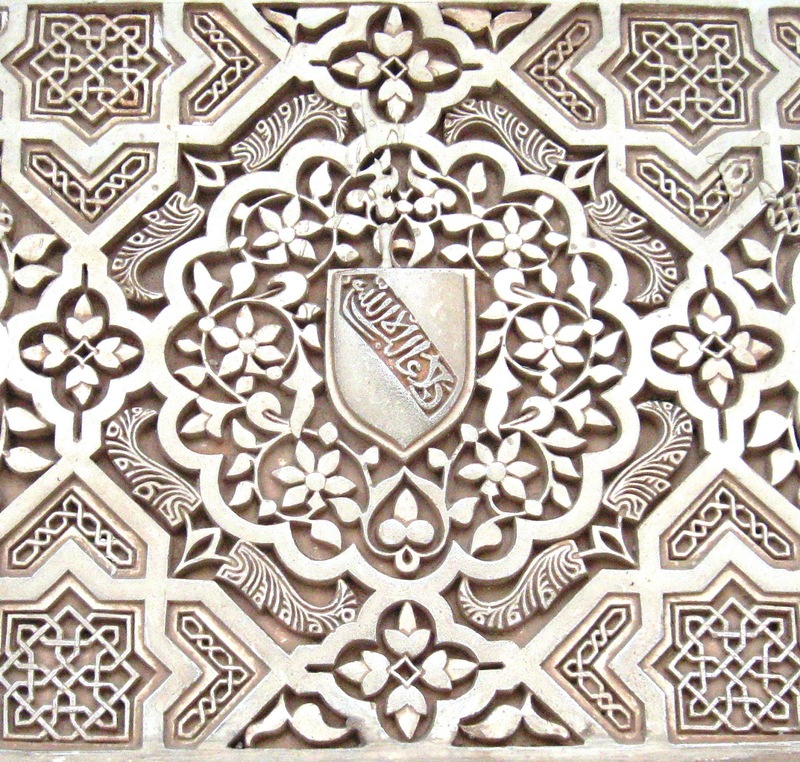 The patterns were a combination of geometric patterns, as well as Islamic inscriptions. For example “The is no Conqueror but God”, the one time battle cry of the Nasrids, is repeated over and over again on the walls. Here are some details. One is surrounded by these and can spend a whole day studying the patterns, if if one can’t read the inscriptions. The top of a pillar — one can see remiains of blue paint. A long day pleasant day, with only a few places to sit. Yes, we went there in mid-December last year, and it was not crowded. It was cold, but not unpleasantly so! Isn't it an amazing place? The amount and intricacy of the patterning is wonderful and you have captured it well in your photos. I don't think I have ever been there when it was empty as it seemed to be in your photos. All my photos have random tourists featured in them, as it was so crowded!